By now, I’d imagine most of you reading this are fully acquainted with the fishtail braid. You’ve probably spent time with it over A.M. coffee or tea and it’s possible you’ve even introduced Ms. Fishtail to your family and friends, as well. She’s a good friend, the fishtail braid. The kind that makes you look good even after four hours of sleep or eight hours of sweating in the sun. Like most hairstyles though, you can only repeat a ‘do so many times before it becomes tired and overdone. The solution? Spice it up a little bit! If your go-to fishtail braid is the type that sits off to the side — like a parrot perched on your shoulder — I urge you to try a new variety. 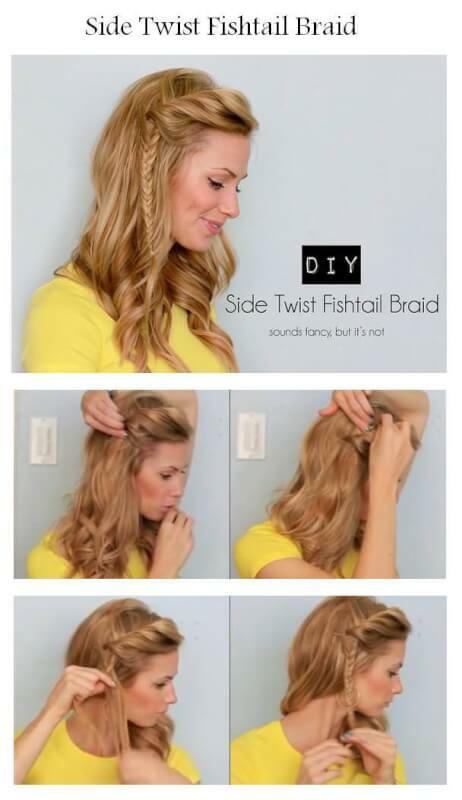 May the below fishtail hairstyles be your catalyst for the fabulous summer hair days to come! I’m pretty sure my heart skipped a beat or two when I happened upon this gorgeous fishtail braided headband tutorial by Yara Michels of This Chick’s Got Style. I’m particularly fond of this ‘do because it works well for various hair lengths and textures. Yara has all the details on her blog, but essentially you create two fishtail braids on either said of your head and then drape them under the crown. Brilliant! 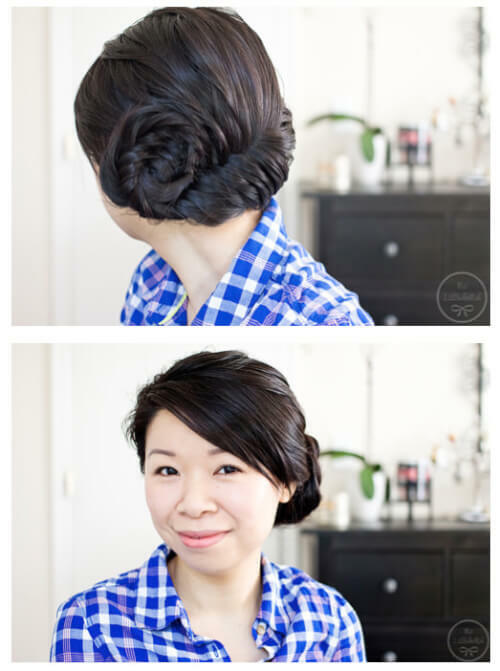 I’ve seen a number of fishtail buns swimming around the blog-a-quarium, but this particular style is one of my favorites. I love that it doesn’t sit too high or too low, which makes it reads casual and feminine without being too fussy or too undone. This tutorial is brought to you by Jennah at A Bird’s Leap blog, where you’ll find an incredibly detailed how-to complete with pictures and text. Katie of the Running on Happiness blog says this style “sounds fancy, but it’s not.” Who doesn’t love an easy hairstyle that makes it look like you spent hours grooming in front of the mirror? I recommend curling all your hair prior to starting and then moving forward with the actual braid. This will give the braid a little extra texture and volume. Oh, and by the way, this side twist fishtail braid is great for summer since it helps get hair away from your face. How can you go wrong with a hairstyle that uses just about every hair-related buzzword of the moment? 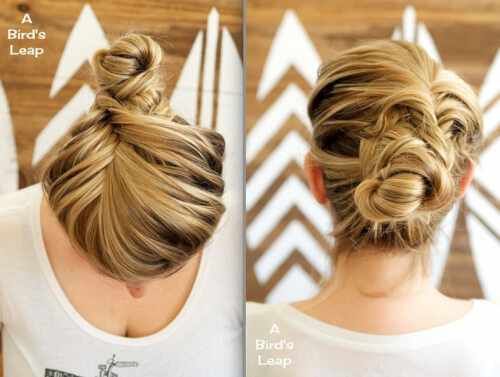 This wrap-around brain bun by YouTube user MakeupWearables starts with a sock bun (for oomph) and then wraps two separate fishtail braids around the bun. This one works best for longer hair, but you can always fake length and volume with some temporary extensions. I love the multi-dimensional vibe this fishtail braided ponytail style gives off. I imagine it being worn on the hippest of chicks in the coolest of places! This particular style was created by Kayley of the Sidewalk Ready blog and is essentially a halfsie fishtail braid that’s been gathered into a low ponytail. You can keep the ponytail as is (I actually prefer it this way! ), or if you want hair off your neck completely, create a quick bun. The video tutorial is really helpful. I am absolutely tickled over the fact that this fishtail updo subtley resembles a seashell. Too perfect! And the best part is that — despite it looking really complex — this updo is pretty simple to recreate. Mel from La Belle Mel walks you through the steps in her quick, four minute video tutorial. If you want to add a little extra something to dress this one up, try a seashell hair accessory. You can even make one yourself by gluing a small seashell or starfish onto a hair comb. Fancy the fishtail braid, do ya? Then you’ll really love this Great Gatsby-inspired fishtail faux bob!